Chicken Little Classic Slot Guide & Review - Casino Answers! 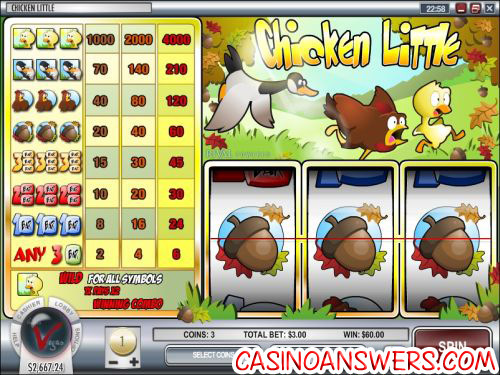 Chicken Little is a 3-reel, 1-line classic slot machine developed by Rival, featuring a wild symbol and multipliers. You can play the Chicken Little reel slot machine at Bovada. To start playing the Chicken Little slot game, you can set your coin size at $0.01, $0.05, $0.10, $0.25, $0.50, $1, $2 or $5. Once your coin size is set, you can bet up to 3 coins per spin. The lowest total bet you can make on the Chicken Little slot game is $0.01, while the largest total bet is $15 per spin. To play all three coins, use the “Bet Max” button. To play with one or two coins, just use the “Spin” button at the right. There is an autoplay option available for real money players. To win Chicken Little’s 4000 coin top fixed jackpot, you must make the 3-coin maximum bet. If you can hit three Chicken Little symbols on the center payline, you will win the 4000X top jackpot. The Chicken Little symbol is wild and can replace any symbol in a winning combination. One Chicken Little symbol will also double your winnings. Payouts on the Chicken Little slot machine are as follows (1/2/3 coin payouts in parenthesis): 3 Chicken Little symbols (1000/2000/4000), 3 Loosey Goosey symbols (70/140/210), 3 Henny Penny symbols (40/80/120), 3 Acorn symbols (20/40/60), 3 Triple Bar symbols (15/30/45), 3 Double Bar symbols (10/20/30), 3 Single Bar symbols (8/16/24) and 3 of any Bar symbols (2/4/6). There are eight winning combinations on the Chicken Little slot. For those who know the Chicken Little story (especially for those who have young children), we think you’ll have fun playing a few spins of the Chicken Little slot machine. To play the Chicken Little slot machine, sign up at Bovada! Can Chicken Little be played by USA players? Can I play Chicken Little in my web browser? Yes, simply use the Instant Play option at either Vegas Days Flash Casino and Mayan Fortune Flash Casino. If you experience issues playing the flash slot game, make sure you have the latest edition of Adobe Flash Player installed. Can I get free cash to play the Chicken Little slot? Absolutely! If you sign up at Mayan Fortune Casino, they will give you a $14 free no deposit bonus just for signing up!